"Here's How Records Give You More of What You Want:"
They Allow Selectivity of Songs and Tracks. They're the Top Quality In Sound. They'll Give You Hours of Continuous and Uninterrupted Listening Pleasure. They're Attractive, Informative and Easy to Store. If It's In Recorded Form, You Know It'll Be Available on Records. They're Your Best Entertainment Buy. 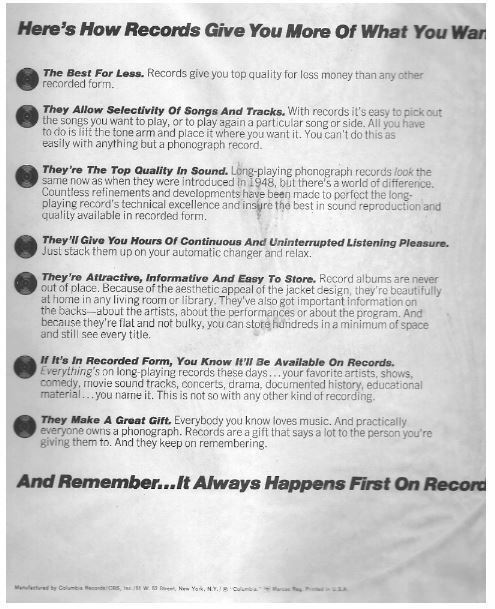 "And Remember...It Always Happens First On Records"